Fresh cilantro sprigs, for garnish. Make the sauce. Roast the tomatillos, sliced onion, peeled garlic and chiles on a rimmed baking sheet 4 inches below a hot broiler until the tomatillos are soft and blotchy black on one side, 4 or 5 minutes. Turn everything over and roast the other side. Remove and reduce the oven temperature to 400 degrees. Scrape the tomatillo mixture into a blender or food processor. Process to a smooth puree. Heat the 1 tablespoons of oil in a medium-large (4- or 5-quart) pot over medium high. When the oil is hot enough to make a drop of the puree sizzle, add the puree all at once. Stir nearly constantly for several minutes until darker and thicker. Add the broth and the crema, reduce the heat to medium-low, partially cover and simmer for about 30 minutes. 2. Roast the vegetables. Spread the cubed vegetables on a rimmed baking sheet. Drizzle or spritz with oil, sprinkle with salt and stir to coat evenly. Roast, stirring regularly, until the carrots are crunchy-tender, about 25 minutes. 3. Finish the sauce, heat the tortillas. If the sauce has thickened beyond the consistency of a light cream soup, stir in a little more broth (or water). Taste and season with salt, usually about 1 teaspoon. 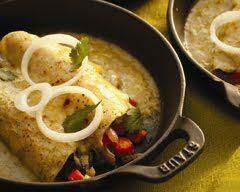 Lightly brush or spray both sides of each tortilla with oil. Slide into a plastic bag and microwave on high (100%) for 1 minute to warm and soften. 4. Finish the enchiladas. Smear a few tablespoons of the sauce over the bottom of four to six 9-inch individual ovenproof baking/serving dishes or smear about 1 cup of the sauce over the bottom of a 13 x 9-inch baking dish. Working quickly so the tortillas stay hot and pliable, roll a portion of the roasted vegetables into each tortilla, then line them all up in the baking dish(es). Douse evenly with the remaining sauce, then sprinkle with the cheese. Bake until the enchiladas are heated through (the cheese will have begun to brown), about 10 minutes. Garnish with onion rings and cilantro sprigs. These are best served piping hot from the oven. A tub of crème fraîche will provide you the closest thing to real Mexican crema. Or make your crème fraîche with the sour cream alternative: Mix equal parts of very good quality sour cream and heavy cream, let stand at warm room temperature until noticeably thicker (about 6 hours), then refrigerate for several hours until very thick.